Females are 132 – 176 lbs. Males are 220 – 386 lbs. Has rings of white or light fur around its eyes. 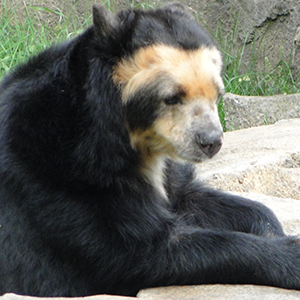 The rest of the bear’s fur is black or dark brown. Mainly plant eaters, these bears are the most vegetarian members of the bear family aside from the bamboo-eating giant panda. Only about 5 percent of their diet is meat and usually rodents and insects. Cubs can ride on the mothers back or she can carry a cub by clutching it to her chest with one front paw as she runs on three legs or walks on her hind legs.